18th of August. A very very busy day for me as I went to the training for the California Fitness Sunway Pyramid Soft Launch at MidValley. After the whole training finish, I drag my dizzy head rush back to my home with the maximum speed I can because I'm going to GENTING with my dear~!! Wooo hoooo~!!! I reach the Pekeliling Bus Stop at 425pm and we're going on a 430pm bus. Phew~ Luckily can reach on time. Wondering why I went to Genting? 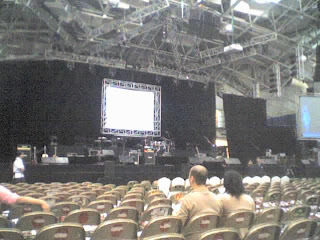 Nothing much... Just to watch Wu Bai's Live Concert... HAHA! Since when I'm a fan of Wu Bai? I'm not his fan honestly, it's just because that my mum's friend got free ticket and she gave me! Since me and Dear don't have anything to do, so we decided to go Genting even though we didn't book any room. We reach there about 6pm, still have one more hour to go and we're kinda hungry. We went to the police station beside Ria Apartment and bought the keropok lekor and sit at the park beside the Theme Park hotel and eat! So delicious!! After finish, we went to walk around... 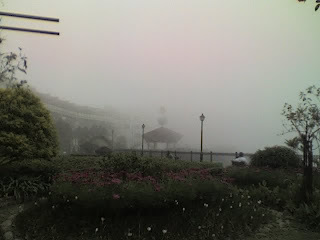 The weather that day was kinda cold and very heavily covered by mist. There's even smoke comes out from my mouth when I'm breathing or talking. So nice, I'm like at UK or something!! Around 7pm, we queue up at the main entrance of the Theme Park waiting for those crew to let us go inside the Arena oF Stars. 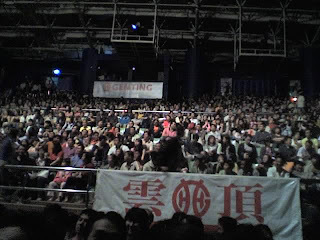 There was alot of aunties and uncles which get the ticket by redeem the ticket with their genting points. The show start at 815pm. Late about 15 minutes but it's ok because those audiences a.k.a aunties and uncles were walking too slow and many aundience haven't reach yet. Even though I'm not his fans, and I was like only know only ONE or TWO(maximum) of his songs, but I still scream and shout and jump till so high. I guess this is the miracle of music which can brings out the natural high-ness in one's heart and soul. Haha! The concert totally got 3 encore. I just can't resist myself from jumping, shouting, waving... Just like Wu Bai's fans... haha~ What more can I say? The hot blood and lust of music is running wild inside my veins and I'm totally went crazy! Miracle of music, Miracle of rock. 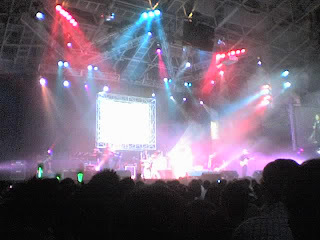 Wu Bai and China Blue's 15th Anniversary. They're the Emperor of ROCK!